Call 1-844-528-8688 for FREE quote on your Medicare Supplement Plan or to get answers to all your Medicare Questions. 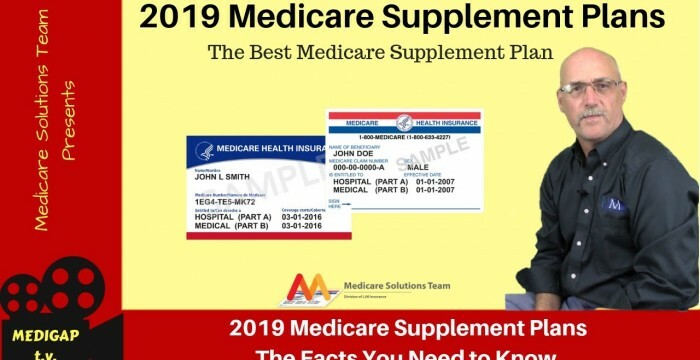 Medicare Supplement Plans 2019 haven't changed much, the best Medicare Supplement Plan for most people is still a Medigap Plan G. While Medicare Supplement Plan N will fit some people, it is not a good fit for all due to the copay's for doctor office visits. Historically the lowest rate increases for Medicare Supplement Plans have been for the Medigap Plan G and Medigap Plan N. With the Medicare Supplement Plan F not taking any new enrollees starting in 2020 that is just another reason not to choose a plan F in 2018. This video has a real case study on the pricing difference of a Medicare Supplement Plan G and a Medigap Plan F. Once you see the comparison I am sure you will opt for either a plan G or a Plan N. The 2019 Medigap costs have not changed much but if you choose the right Medicare Supplement Plan with the right Medicare Supplement Company now, you will save your checkbook some stress down the road. This entry was posted in medicare supplement and tagged #medigap tv, best medicare plans 2019, best medicare supplement for 2018, best medicare supplement plan, best medigap plan, christopher westfall, medicare, medicare supplement plans, medicare supplement plans comparison chart 2019, medigap plans 2019. Bookmark the permalink. Great video thank you.. Quick question what about plan HDP is that also expensive? Irene, the HDF, is much lower cost for premium, but as the name says you will have a large deductible.